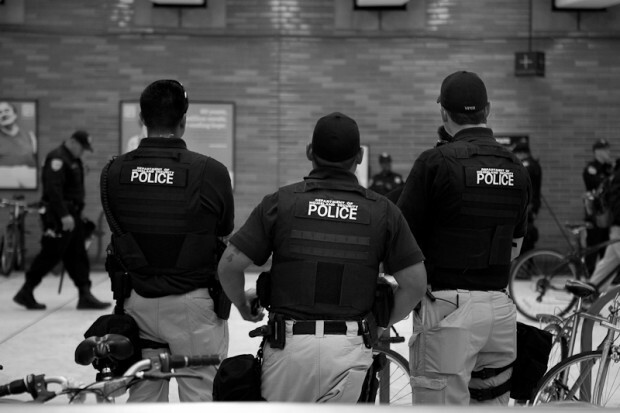 Department of Homeland Security Police at a peaceful San Francisco BART protest on August 29th, 2011.. 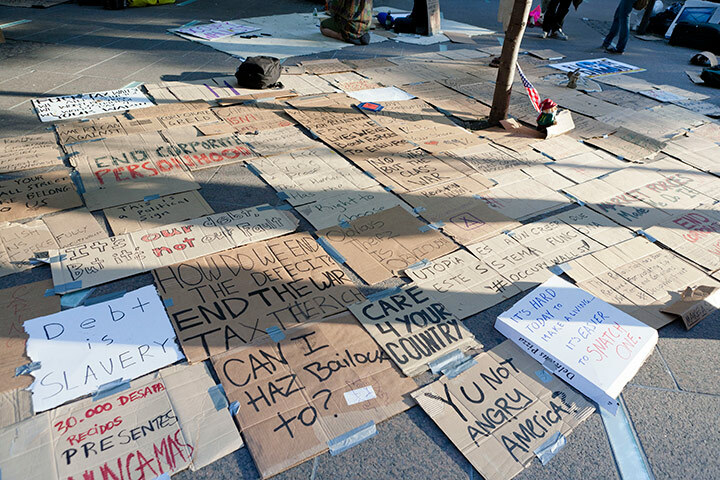 When nonviolent demonstrations (like occupying a public sidewalk) and online civil disobedience (like crashing a website) against Wall Street’s crimes and the hijacking of American democracy by big-moneyed interests strike fear into the U.S. security state, it only makes those demonstrations more relevant and necessary. The mere act of challenging institutional corruption and the security apparatus which protects that corruption, shines a light on that which needs changing, and creates possibilities for reform. The bulletin, issued by the DHS National Cybersecurity and Communications Integration Center (NCCIC), warns financial services companies especially to be on the lookout for attempts by Anonymous to “solicit ideologically dissatisfied, sympathetic employees” to their cause…The DHS alert also warns of three cyber attacks and civil protests it says are planned by Anonymous and affiliated groups. 2) The Department of Homeland Security has been monitoring protests against Bay Area Rapid Transit (BART), an organization that video has captured committing egregious acts of police brutality and, with the help of telecom companies, had shut down cell communication of activists there. 3) The Justice Department has been arresting and prosecuting members of Anonymous for what some call a form of online civil disobedience, but has failed to start even one investigation into Wall Street’s criminal activity. Any alleged crimes Anonymous may have committed pale in comparison to the havoc wreaked on America in 2008 by casino capitalism. Some 1,271 government organizations and 1,931 private companies work on programs related to counterterrorism, homeland security [emphasis mine] and intelligence in about 10,000 locations across the United States. According to the DHS and other agencies, Anonymous and US Day of Rage now fall under the auspices of “homeland security.” Where does this “mission creep” end? Habeus corpus has effectively been eradicated for anyone deemed a “security threat.” Think about that. The demonstrations planned for September 17th represent nothing less than the first direct, unflinching challenge to the hijacking of American democracy in recent memory. 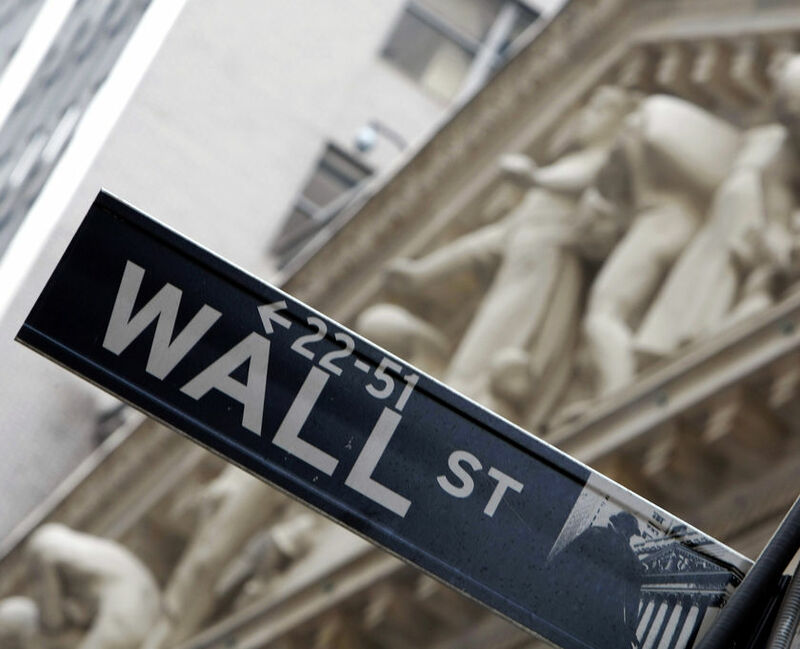 Remember that Wall Street’s power over this country’s politics has largely gone unchecked. No prosecutions of the Street’s criminal class have occurred. 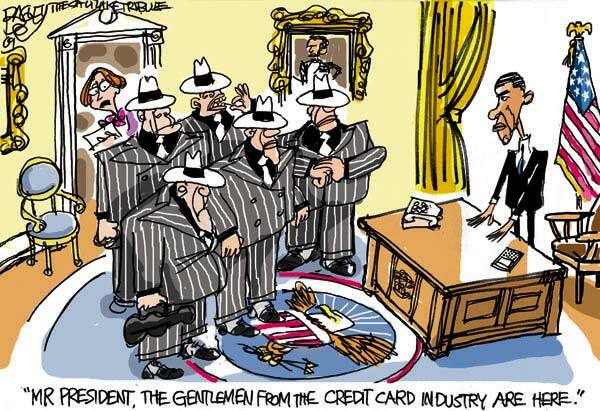 Indeed, they’ve corrupted institutions like the SEC, which was created to monitor and regulate the financial sector. And to make matters worse, the Obama administration is going out of its way to avoid investigations into Wall Street malfeasance. Large corporations are now able to pour unaccounted amounts of money into elections, effectively drowning out the voices of everyday Americans. The writing is on the wall: We are rapidly losing our democracy to corporations and other special interests, and they are being aided and abetted by a sprawling security state that protects the elite while limiting dissent. “One citizen. One dollar. One vote.” That is US Day of Rage’s simple demand. And it is this crucially important idea that has the U.S. security state sending out bulletins to the very criminal class that has, until now, gotten away with barely a slap on the wrist. It is because of this that the peaceful revolution to restore power to We the People must continue. 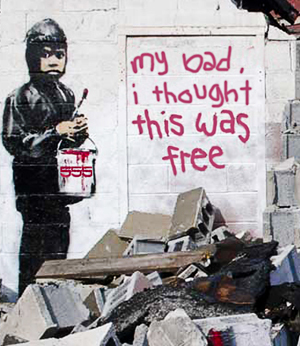 September 17th, 2011 isn’t just about Wall Street. It’s about challenging an utterly dysfunctional, corrupt system, a system with a security apparatus which seeks to protect the real threat to national security: the Too Big to Fail banks and financial institutions in Lower Manhattan that brought down the American economy. For more information on the alarming expansion of the U.S. security state, visit: Ten Years Later: Surveillance in the “Homeland”, a comprehensive collection of investigative journalism by Truthout in cooperation with the ACLU of Massachusetts. 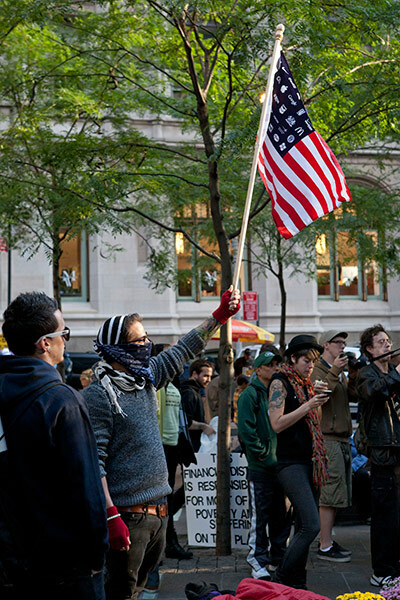 For the latest updates on US Day of Rage’s peaceful occupation strategy for September 17th, 2011, visit here. Please subscribe to The Project to stay up to date on the latest developments concerning the September 17th occupation, including on the ground coverage of the event that weekend. Videographers who would like to commit to recording and producing a short film of any of the actions taking place across the country, please contact the Project. A year or so ago, the notion that Americans would descend on lower Manhattan to set up peaceful barricades, outdoor kitchens and attempt to camp out for a couple of months would seem unlikely, if not laughable. But on September 17th, 2011, that’s just what’s going to be attempted. 1) Big banks are pushing hard to walk away from mortgage fraud with nothing more than a slap on the wrist, and the Obama administration is perfectly fine with that, even going so far as to remove proponents of a thorough investigation into Wall Street malfeasance. 2) Wall Street influence has infected the highest levels of the SEC, the very agency that’s supposed to regulate the market. 4) And yet, not a single prosecution has come down from the U.S. Department of Justice for any of Wall Street’s casino capitalists. When government becomes unresponsive to the needs of the people and fails to punish the very criminals that were bailed out by the American taxpayer, the people must (as our ancestors did for labor and civil rights) organize nonviolently to take matters into their own hands. 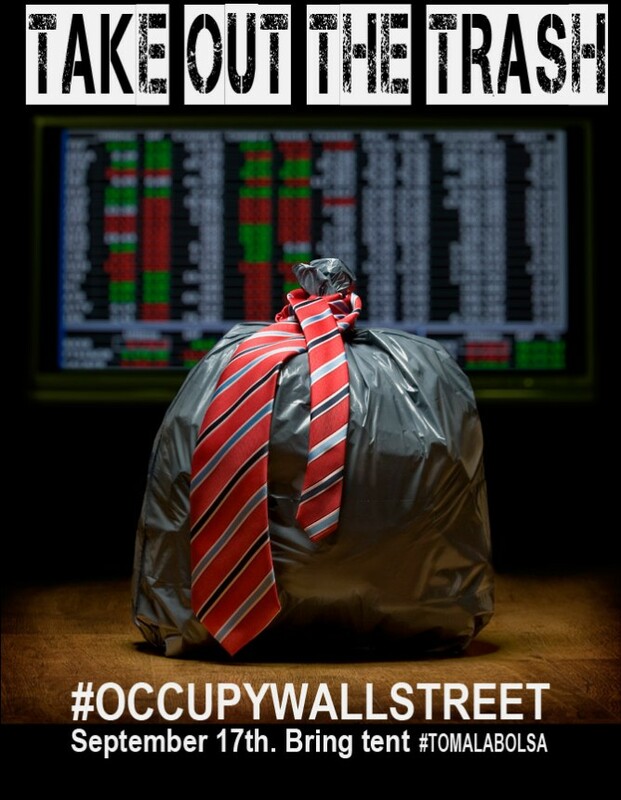 The Occupy Wall Street (@OccupyWallStreet) movement will demand an end to “the influence money has over our representatives in Washington.” The organizers state: “The time has come to deploy this emerging stratagem against the greatest corrupter of our democracy: Wall Street, the financial Gomorrah of America”[emphasis mine]. By attempting this occupation, the organizers hope to strengthen and amplify their message to D.C. that politicians must begin addressing the problem of special interests’ influence on government. People from across the country “have stepped up to organize this event, such as the people of the NYC General Assembly and US Day of Rage” (an interview with the latter organization can be found here.) The hacker group known as Anonymous, which has recently been organizing protests against the Bay Area Rapid Transit (BART), has now joined the movement as well. How successful will this effort be? Things could get sticky. An occupation of the Street has never been attempted before. 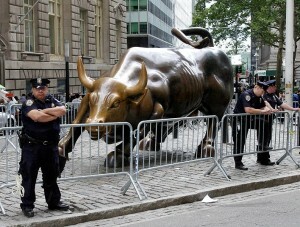 Wall Street has a strong security presence, especially after September 11th, 2001. And it’s not clear, with heavy NYPD interference quite likely, just how many people will end up staying past the weekend. The true test of this movement, then, will be its commitment to persistence, and also how much media attention it receives. A movement truly fails only after it gives up. I think that’s an excellent place to start from when organizing nonviolent resistance against the American oligarchy, don’t you? Subscribe to the Project to stay up to date on this and other upcoming actions. 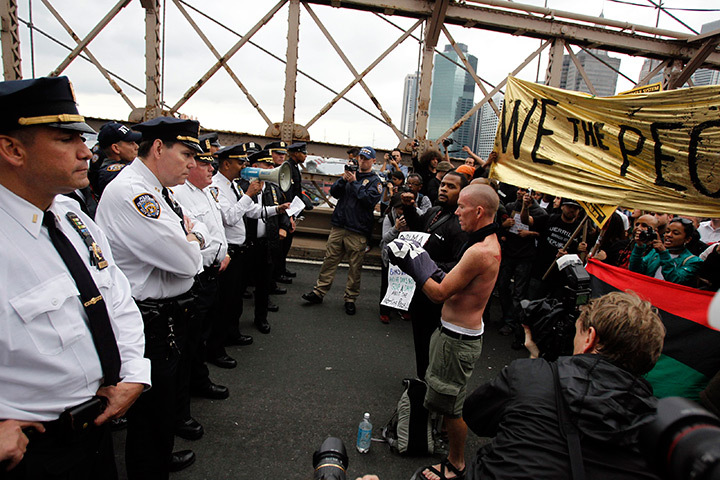 We will be on the ground covering #OccupyWallStreet. Please contact us if you would like to participate in covering this event as either a journalist, photographer, or filmmaker. After a brave SEC whistleblower named Darcy Flynn came forward with the evidence destruction charge, the SEC has apparently ended the practice, but the Wall Street sympathizers who now head the SEC are still in charge. How can the SEC be trusted to police the same forces that caused the ’08 collapse when their sympathizers are running the show? We now have a political system that is blatantly manipulated by a jaw-dropping amount of cash from both corporate, and to a lesser extent, organized labor. 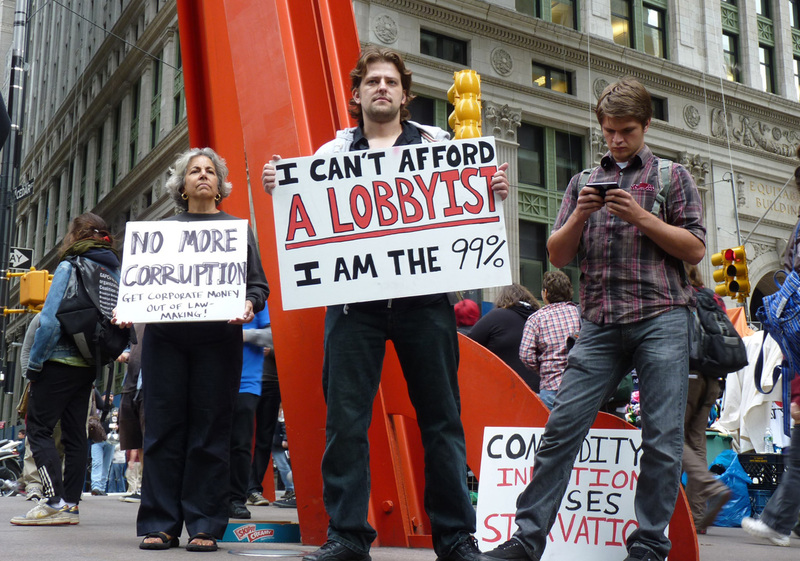 Thanks to the Citizens United decision, which allows unlimited amounts of special interest money to be poured into political advertising and political action committees (and with no accountability), the power of ordinary citizens–of the individual, the foundation of a healthy democratic political system–to participate in the democratic process is now alarmingly eroded. Combine Citizens United with the fact that a coalition of corporate interests called The American Legislative Exchange Council (ALEC) has designed and lobbied legislation on the state level that is in the process of disenfranchising millions of voters under the guise of “voter fraud,” and it’s abundantly clear that the end of the American democratic experiment is very much within sight. In fact, it may already be too late. “USDOR began the night of March 10, 2011 when I created the twitter profile @USDayofRage. I was watching coverage of events in Wisconsin. I had been covering the ‘Days of Rage’ – people’s non violent protests from Egypt into Europe for several months by then, watching those events unfold on Twitter and Facebook. What I saw that night in Wisconsin was a dangerous level of cynicism towards government. The idea behind this new movement is simple: “One citizen. One dollar. One vote.” In other words, it’s time to return the democratic process to the hands of those for which it was originally intended: the American people. And state-level organizers have indeed begun planning in 13 states and three cities, which will start with protests in Idaho on Sept 16. Then on September 17th an endorsed call to action to #occupywallstreet, an occupation of America’s financial nerve center by “an independent public NYC assembly to camp on Wall Street,”according to O’Brien. She added later that she doesn’t think Americans are complacent, only demoralized and disengaged from the political process. The non-violent struggle to reclaim our democracy from powerfully-entrenched special interests will indeed be an uphill one, and will almost assuredly be fraught with setbacks. Yet not acting to save this country from the corruption that holds us all hostage simply isn’t an option. Not only do we have a moral imperative to try and change the system for the legacy our ancestors created for us, but for future generations as well. Those future generations will look back at our struggles and hopefully gain inspiration and resolve to continue the fight where we left off, if we fail. Subscribe to The David and Goliath Project for updates within the next few weeks on US Day of Rage, plus other news.